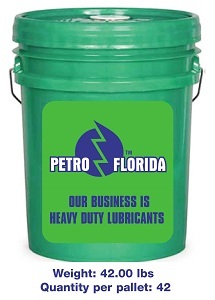 PETROFLO SYN-COMPRESSOR OILS are a line of high performance synthetic lubricants that are suitable for use in many types of air compressors to include reciprocating (piston) and rotary compressors (sliding vane and cylindrical screw). PETROFLO SYN-COMPRESSOR OILS are formulated from the highest quality base stocks combined with advanced technology additives to provide exceptional advantage over conventional petroleum based lubricants and over other synthetic lubricants. • Outstanding Thermal and Oxidation Stability. • Extended Drain Intervals up to 8 Times Longer than Achieved with Petroleum Oils. • Lower Operating Costs through Increased Lubricant Life. • Less Build up of Sludge and Varnishes (Compressors Operate Cleaner). • Longer Equipment Life Reduced Maintenance Required. • Low Pour Points / Good Low Temperature Viscosity. • Good Cold Weather Start-Up (less wear and friction). • Longer Equipment Life Less Downtime. • High Flash Point and Auto Ignition Temperature. • Reduced Likelihood of Compressor System Explosion and Fires. • Better Productivity Safer Operation. • Excellent Air Release Characteristics. • Better Compressor Operation Cleaner Air Less Oil Loss. • Less carry over of Oil in the Compressor. • Low Carbon Forming Tendencies in Piston Compressors. • Increased Operating Time by Eliminating much of the Downtime usually Required for Cleaning Discharge Valves. • Better lubricity and lower volatility than conventional petroleum oils. • Lower lubricant feed rates for compressor cylinders – Less consumption. • Lower operating costs through reduced lubricants make up rates.